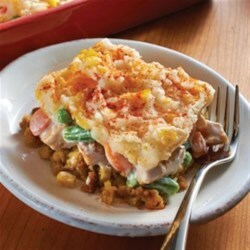 "This layered casserole with stuffing, turkey, veggies, mashed potatoes and cheese is the perfect way to serve Thanksgiving leftovers." Prepare stuffing as directed on package; spread onto bottom of 13x9-inch baking dish sprayed with cooking spray. Combine turkey, mixed vegetables and mayo; spoon over stuffing. Mix potatoes and cheese; spread over turkey mixture. Sprinkle with paprika. Bake 30 to 40 min. or until heated through. This monkey bread is stuffed with turkey, potatoes, stuffing, and vegetables. Prepare using KRAFT Light Mayo Reduced Fat Mayonnaise and KRAFT 2% Milk Shredded Cheddar Cheese. If you don't have any leftover stuffing, you can use 1 pkg. (6 oz.) STOVE TOP Stuffing Mix, prepared as directed on package, instead. Substitute cooked ground turkey for the chopped leftover roasted turkey.